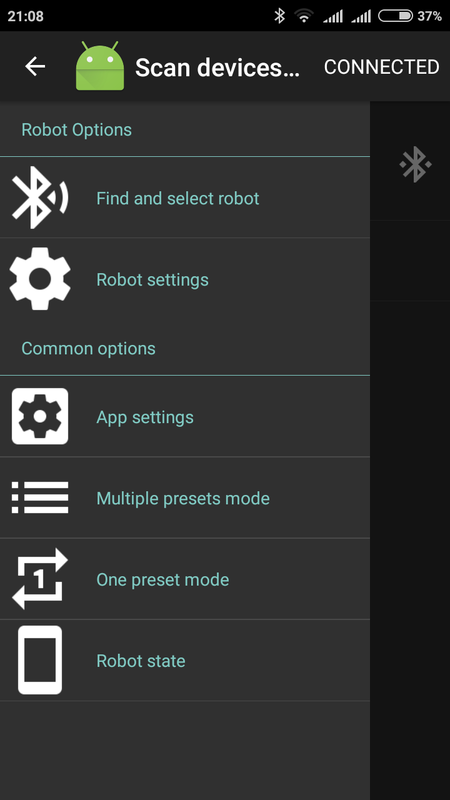 The robot is controlled via Android application with Bluetooth LE (app was written with Xamarin Forms framework). You can setup tons presets and create a program based on them - up to 200 presets for one program. After that you can run a program from IR remote even without a smartphone. Also, you can use any IR remote, because robot can learn commands from any IR remote and save them for the future. My robot is still under construction. Now I am a participant of "ST Embedded World 2017 Contest" with this video https://community.st.com/videos/1284-table-tennis-robot. If you enjoy my project, please support me - please like this video at st.com (registration is required, it takes 2-3 minutes). This will help me to win 3D printer, so it will give me ablility to continue my work. Thank you. Last edited by vedroitt on 25 Mar 2018, 18:03, edited 3 times in total. So it looks like it has 2 wheels, which can be controller independently, right? Yes, you are absolutly right. Step of speed change is 50rpm, speed range of each wheel is 700-7000rpm (can be extended up to 8000rpm). And any of them can be reversed. I love the idea of making everything programmable. In theory you should be able to produce any type of spin and speed independently. Unfortunately, it's very hard to make them truly independent, even the top robots have trouble with this. I think with 50rpm speed step you really can do any spin. This is real precisely speed, which measured by system - not approximation. Wow that looks fantastic, great effort! He's obviously got access to a nice workshop with some tools.. Actually, these days, a great deal of stuff you'd need is available through the likes of banggood.com - stepper motors, controllers, gears, even aluminum extrusions and microprocessor-based stuff like Arduino. People make things like robots and 3D printers out of it. Of course, you need the skills to put it together, and I'm in awe. Nice robot & smart phone controller! I wonder when the robot manufacturers will get with the times and have something similar. Also, have you thought about having rotating heads so you can impart side spin? Nice robot & smart phone controller! I wonder when the robot manufacturers will get with the times and have something similar.? If you use any robot at home, it's not problem to mount any grid around your table - you have to do it only once, and then you can use it everyday. But if you have no own tennis table (or a place where you can mount it), probably you will use robot in gym or in the tennis club. In this case you have to setup your robot near the table again and again, each day. I think additional grid can be a problem in this situation. I have thought about creating the compact robot, which can be used in any place and will have small weight - like a Trainerbot, but it has container only for 30 balls, for me it's too small quantity. My robot has basket for 100 balls, and I suppose my robot is more powerful and can create much faster balls with precise spin. When will you take orders for the robot? 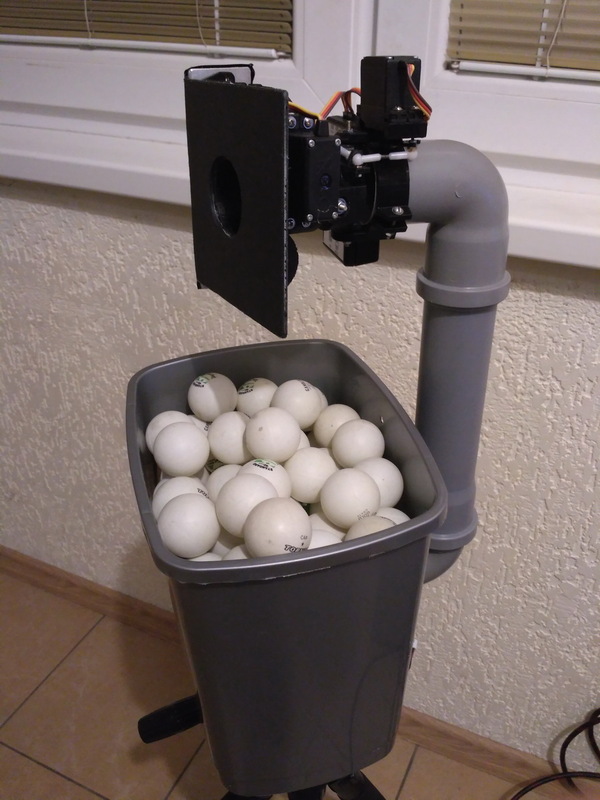 About catch net, you could use something like the ipong catch net (they have two versions), and devise some sort of automatic collector that would feed the balls into the bucket.... voila you have an automatic ball recycling system. Such a system would be really great.